Time was that Alipay was a wholly owned unit of China’s Alibaba Group. Then suddenly and without much of a word to anyone it became an affiliate of the Alibaba Group, owned by none other than Alibaba CEO Jack Ma. No one was more surprised than Yahoo, which happens to own a 43 percent equity stake in Alibaba. It is reasonable to assume that Yahoo was not happy about the sudden change. Soon they reportedly reached some kind of agreement. So what was that about? Expect AllThingsD’s Kara Swisher to ask Ma about it, and the state of the Internet in China, and probably a lot of other things during his onstage appearance. 5:40 pm: Kara and Jack are on stage now. Jack: Apologizing ahead of time for his English. Carol is my investor and partner. We sort of had some tough days before, but we’re working on it. Kara: What have been the problems before? Jack: We have a different view of the China market. Kara: What is that different view? 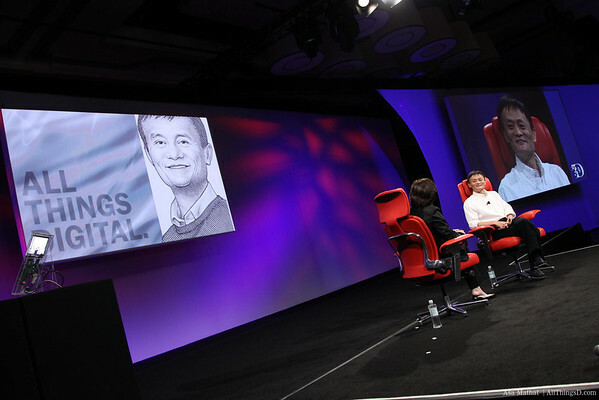 Jack: I think Yahoo did a pretty good job in the States, but in China probably not that good. We’re trying to turn that around. We will be focused on the small-to-medium business, and on e-commerce. They have different ideas. Kara: What were the different ideas? Jack: I think when we first met, she was not happy. But I would be very happy if Yahoo USA came back. Kara: But a “mind your knitting” kind of thing. Kara: Asking about Alipay. Insinuates that Jack stole it from the other shareholders, including Yahoo. Jack: I heard a lot of words like “stealing.” This is like peace talks at the United Nations. It’s impossible that the board doesn’t know what was going on. Yahoo is thinking about Yahoo shareholders. Softbank is thinking about its shareholders. I have to think about all of them. Someone has to take responsibility to move ahead. Kara: So where are you now? Recently they have been more nice about it. Jack: Because I’m the good guy. Kara: Where are you in settlement negotiations? Jack: We got the license. We are setting up examples for China’s companies, that doing business in China, we have to be 100 percent legal and transparent, and making sure the company can last long and grow. Based on that we started to talk. I think the happiest days in my life is when I worked for $10 a day. After three months I could buy a bicycle. Money isn’t my interest now. Kara: How close are you to an agreement? Jack: Its complicated. I’m optimistic. Kara: But you expect to have some settlement. Jack: Sure. I’m the single largest shareholder of the Alibaba group and I have to look after all the other shareholders and employees. Kara: Would you like to be less of a shareholder? Jack: If we can do something like that, sure. Kara: How much foreign ownership would you like? Jack: I’d like to try to diversify. Kara: Is this an object lesson on doing business in China? What do you say to companies who have had difficulty moving into China? Jack: It’s difficult to do business everywhere. I see thousands of companies die every month in China. So I think Yahoo and Google and eBay and these companies that are successful, the ratio is small. We will face the same challenge coming to the U.S. someday. 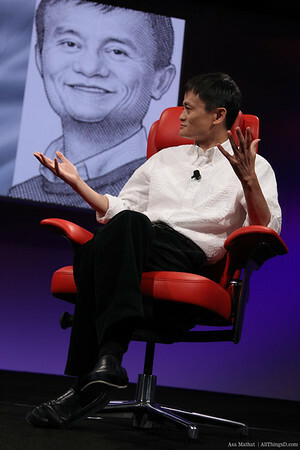 5:50 pm: Jack: If you want to do business in China, send your best people who serve your customers, and not the investors. There are a lot of gamblers and hedge fund investors who I have no sympathy for. Kara: How do you assess your competitors? First, talk about the idea of you coming here, and Chinese companies coming here. Jack: Our competition in China, I do not see strong competition. We are trying to make sure that Alibaba is the infrastructure of Chinese commerce, and most of China’s companies are about building products. Kara: Talk about Alibaba Group’s several different entities. Jack: We were born in 1999. I want the company to last 102 years so that it lasts across three centuries. Kara: So in 2101 you’re finished? Jack: Is that true? I’m not good at math. We grew from 18 people from one company focused on B2B import/export. Then there’s TaoBao, which focuses on small B2C. Then there’s Alipay, which some people compare to PayPal, which isn’t correct. It’s more of an escrow service. And we have Alibaba Cloud Services. And the fifth company is Alibaba Logistics Company. Kara: So how do you plan to move into the U.S.? Jack: We acquired two companies in California. We have 90 years to go, so don’t worry. Kara: Could you buy Yahoo someday? Jack: I would love to, if someone would lend me the money. Buying things is fine, but making things is more fun. Kara: Do you see Chinese companies coming over and buying American companies? Jack: Lots of people are dreaming about that. 5:57 pm: Kara: How do you do business in China? Jack: Everywhere I go, people ask me about censorship. But I tell them that if you follow the law, you’ll be fine. But China has more than 500 million entrepreneurs. As an entrepreneur I see the opportunities. 5:58 pm: Jack: I remember 15 years ago people saying that when a government law comes, people try to get around and avoid the laws. With Alibaba, I try to follow the laws. Kara: Let’s talk about your religion, the religion of business. Talk about your three rules. Jack: Customer number 1, employee number 2, shareholder number 3. If the customer is happy, the business is happy, and the shareholders are happy. Jack: I spend most of my time in airports. I ask myself why I’m still working so hard. It’s because I see that we’re changing society and improving China. I got a note from someone saying ‘Thank you for Alibaba, because of you we hired three more people.’ I don’t smoke, but they sent me a pack of smokes. Kara: Is this a sign of changes coming in China? Jack: We are changing China. We make credit a sign of money. The references you have from customers, we make you richer. Kara: What are the key trends in China right now? Jack: Custom and people, and third, the shareholders and governance. My advice to everyone: Government is the same no matter where you are: Love them but don’t marry them. Don’t do business with them. Kara: What are the key business trends? 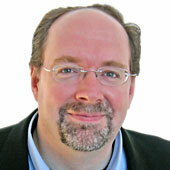 Jack: Mobile and gaming, and search engines. 6:03 pm: Kara: This idea of fast innovation happening in China–when does a company come out of China that’s like a Google or something, that doesn’t come out of a clone of other companies? 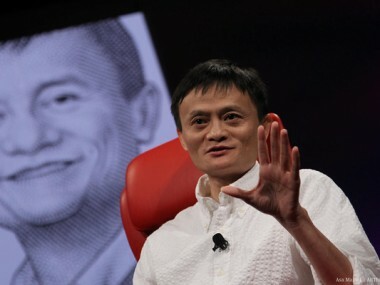 Jack: When Alibaba started, there were about 2,000 companies that copied our model. We believed the dream. Today we are probably the only B2B left. The copycats can’t last long. Jack: The scholars told me that every other country had the same problem with copying. If companies like us are successful, people will say it’s because of the mission and the business. Jack: When I go to forums, it’s always boring to listen to the guys from the large public companies. When I talk to small and medium businesses, I get excited, because I know they’re going to be the big companies someday. 6:07 pm: Questions, first about Africa. I was planning to go there in July, but because of Alipay, I won’t. Question: Do you have any advice for Yahoo, given their problems? Jack: It is not easy for anyone to turn around a company. I have a lot of respect for people trying to turn around a company like Carol [is]. It’s not an easy job. I think Yahoo should be more open-minded in using various ways to solve its problems. Jack: People give hundreds of ideas. What does the management and board of Yahoo want to do? I want to know what they are thinking. Jack: Maybe split it into smaller pieces. Question: When you look at different successful Chinese companies, what lessons might you share in how they hire, train and compensate people, whether it’s Baidu or other companies? And how can Western companies become more successful? Jack: This is my favorite question. There is no best people “outside the company.” I think the best people you train yourself and you develop. Multinationals use headhunters and try to find the best people. I applied three times to university and failed. I tried to apply for 27 different jobs and failed. 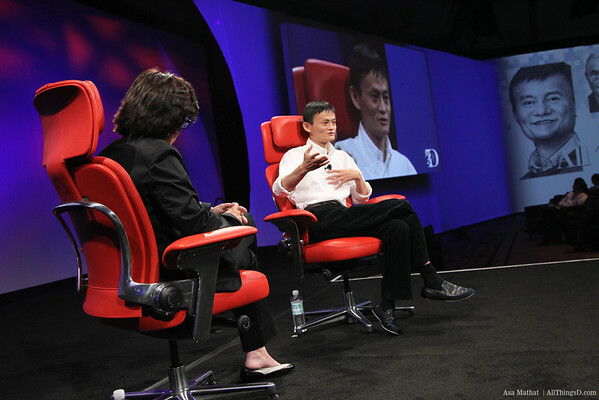 Today the reason Jack Ma is up here talking to you is because I learned. Treat your people well. China is different from the other nations like Japan and the U.S. China is more entrepreneurial than Japan or the U.S. Give young people a lot of opportunities. I spend a lot of time and resources on training our own people. I hope–like Jack Welch says–that 20 or 30 percent of the CEOs of other companies come from our company. And we’re done. Come back later for Kara’s interview with Marc Andreessen! I havent gotten my teeth cleaned in six years, but if it was a Sunday afternoon and I could do that impulsively, I would do it.